Getting slow speeds in my area. 0.5 - 1.5mb at most times. Can you advise what the update is? you guys keep deleting my posts, if this is how your going to treat us then watch this space, i along with other members of the community will follow in the footsteps of what happened to vodafone. Has this been moved or deleted or marked as hidden to hide from the members of the public? Could a optus member enlighten us on what the issue is? This problem has been on going for long enough and im getting beyond tired of calling your support team to restart my modem and isolate it over and over again. we know there is a node issue and that your ports are being hammered by your IPTV services and netflix etc. whats the resolution and what is the time frame? 1.2mbps in todays age is just beyond me. Hey V2K. - same as you, I got a whole thread going and plenty of people with the same issue. No confirmation or ticket / system numbers to prove the upgrade otherwise, pushed back every month. Hi guys, I've replied to you both on this thread → Internet. This matter hasn't been fixed. It is now the 1st August. I was advised by optus the roll out would be finished on the 30th July. I guess this didn't happen. I am NOW getting dialup speeds just like i HAD 17 years ago. Could you honestly get your act together? I've called you call centre over 50 times in the past 6 months. Now to be advised that the new dates are COB Thursday 6th when upgrades are due to complete. We'll optus. You have until then... otherwise myself with 10+ members and others in the area who will be making the move to Telstra Bigpond. 6 Long months its been since you moved in with your netflix package and look where we are. As far as i can see, you've shot yourself in the foot. Forget about waiting for the NBN to fix the issue. Fix the issue at hand. I am glad to see I am not the ONLY one complaining about this. Truly, Optus is guilty of selling snake oil when it comes to this wonderful unlimited net package and the "fetch"
My issue started at the end of March and early April, I am getting some absolutely atrocious speeds inconsistently. 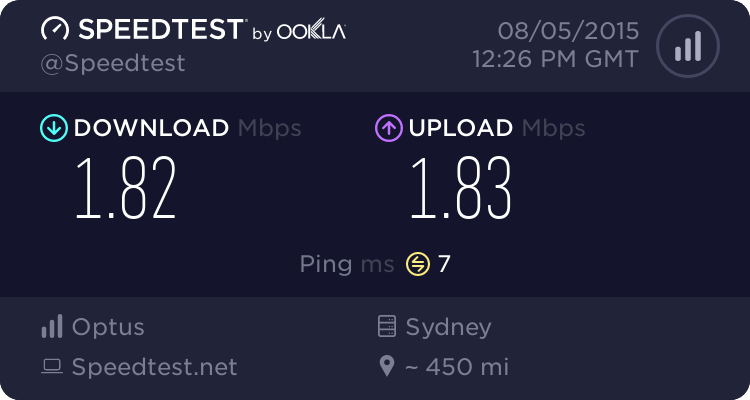 I check Optus and Ookla randomly to try and see how things are going but, it is rarely a great outcome. I am sick and tired of the BS coming from the Asian side of Optus with people of little to NO knowledge telling me one thing and another, it's embarrassing from a company THIS large to have such incompetence. I phoned Optus twice in two months at the beginning and was told it would be ALL fixed at the end of June, I was given a discount for 3 months. I did post in a thread on this forum regarding the terrible speeds and got a story about Optus can't fix the issue as quick (sic) as was promised and that the NEW fix date was end of July well, today is the 2nd of August and no fix, surprise surprise? 30 minutes ago I tested the crappy speeds and guess what, 2.26mbps D/L and 1.86mbps U/L? not bad for a connection that is supposed to have a speed pack attached to it and, it can't even reach ADSL speeds. I think it is time that Optus is reported to the Ombudsman https://www.tio.com.au/ and see if they can fix the problem and stop the BS, it's obvious that Optus can't fix the problem or tell the truth? Any Moderator want to tell me another pack of BS? I just received my Optus bill for the net and I am going to phoning Optus tomorrow and inform them that I expect recompense for this less than average service and maybe it is time to dump Optus altogether and go swimming in a different Pond? Well, I phoned the asian support people and they first wanted me to check my computer, waste of time and, I am STILL having the SAME issue, POOR speeds. I explained to the person I spoke to about the crappy line speeds being caused by OPTUS and NOT my computer and asked when it will be fixed THIS time. First it was end of June, then some mod from this forum says the end of July because of some OTHER issue that Optus is having in my area, (not MY fault) and now who knows? the person said phone in a couple of days and see????? is this how Optus runs it's business? no wonder the line service is rubbish. Does any mod want to try and give me a time? or, maybe a phone number where I can speak to an Australian? about this issue instead of a run a round? I know businesses have problems but, it is NOT the customers fault, Optus should have fixed the fault by NOW or, they should NOT have put so many people on this service if they knew it would NOT handle the amount of traffic and I believe, Optus knew only TOO well it would crash. BTW, here is the result of my speeds tonight at 10.15pm 05/08/15 using the Optus (lack of) Speed test. Pretty sad huh? upload speed beats the download, farcical. @pendaws, I really do apologise that you're also impacted by problems on the network. I can definitely understand how frustrating this would be having to put up with slow speeds every evening. The ETR's that we are given are always going to be tentative as there are a few factors that can delay the network upgrades. We're definitely working on getting these upgrades completed as quickly as possible though. I do appreciate the fast reply but I would like to know how long this is going to be before it is fixed? Last night was a VERY bad night with the upload speed beating the download, I cannot believe that it can take 4 months to fix a problem that should have never been one in the first place. Is there ANY light at the end of the tunnel for August or am I hoping for too much?